there. Some are still doing this today. 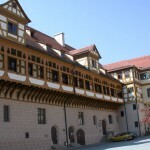 For additional information you can use https://www.tuebingen.de/en/. There is also a web cam installed on the City Hall and shows you the market place in front of the city hall. Conrad Kemmler born Jun 19, 1685 started together with his wife Frau Margarethe Noppel the Kemmler line in Tuebingen. The ancestors of the founder of the well-known building material retailing company Kemmler are as well from Wankheim. Additional research has to be done in Tuebingen. The Lutheran parish records are available locally, but they may not be accessible to the public. Copies of the books and registers have been microfilmed by the Wuerttembergische Evangelische Kirche. Copies of the mircofilms are available as well from the Mormon church. 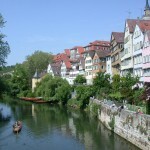 Scenic view on Tuebingen’s lake side from the Neckar bridge.